It's that time of year once again. An occasion for tradition, customs and yes, even folklore. 1) Roll eyes at the mere suggestion from me that perhaps "we should get our lights up". Grunt something incomprehensible as a response, thereby not committing to anything at all. 2) Wait until the mercury dips below freezing to even consider spending the entire weekend outside without gloves on. Preferably hold off until there is both ice AND snow on the roof for the ultimate shot at sympathy. 3) Finally give in since an ice storm has now fulfilled requirements in Step 2, taking an entire afternoon to recall where the hell he stored them somewhere in the garage last Spring. These three steps should be complete by the end of Day 1. 4) The following day, said boxes are finally opened, only to reveal a severe shortage of mounting clips exists. 5) Huge balls of lights are detangled into individual strands (a whole afternoon exercise whilst sitting on the floor watching the movie channel), sorted and stretched out across the livingroom, dining room and kitchen floors. 6) Next comes the annual game of Chasing The Cats, shooing them away from live strands or from crawling inside boxes. Similar to the hunting tactics of a pride of lionesses zeroing in on a doomed wildebeest, the trio of sneaky felines keep him occupied for some time. 7) As each strand is tested, mandatory swearing ensues when it's discovered that less than half the lights actually work anymore. 8) Sort into two piles: Lights-That-Miraculously-Work and the Damn-Stupid-Sets that are once again balled up into a bag and tossed. Day Two ends with the traditional rant about the rip-off Christmas Light Company conspiracy. Day Three: Usually falls on a Sunday when one must wait until after noon to buy replacement lights. 9) Custom decrees that upon arrival at the store, one discovers that last year's lights are no longer manufactured, thereby forcing the purchase of an entire new display. 10) And of course, the minute he arrives back home, hubby realizes he forgot the mounting clips and heads back to the store once again, head hung in faux shame. For I do believe this is simply another delaying tactic as the sun quickly sets. And at the close of the First Weekend of the Annual Christmas Light Extravaganza, the exterior of our home is still dark. Stay tuned for Part Deux, possibly (but no promises) next weekend. Ha ha! You know I tend to agree with him in that it's a bit strange that most strings of lights don't seem to work when you get them out of the box, after very carefully packing them the previous year! I think they put some invisible timer in them, that stops them functioning after six months! Ha ha! Lordy... "Men", eh? Can't wait to see what my man comes up with when we have a house next Christmas... hoboy! Hahahahaha!!! I'm so HAPPY that we don't decorate the outside of our house for Christmas! I don't think it would be divorce exactly, but close. Very, very close. I like your blog. I want you to know it is a conspiracy. See, lights have to be newly bought every year. They are not made to last more than 30 days, unless you are a redneck that leaves them up on the trailer all year. My wife says, "we" need to get a lot of projects done around here, also. Christmas lights ARE a scam! I just bought 5 boxes of C9 replacement bulbs and guess what... NONE of them work in the strings I already own! So now I have to either try to find bulbs that work or go out and buy totally new strings and all new bulbs. Grrrr! I usually put up with half of this debacle before I grab the ladder and try to do it myself. Which is how I almost fell and broke my neck last year. I'm not allowed to use ladders any more. Or the stove. Or the iron. Basically I make myself as useless as possible so I don't have to do anything. I'm wily that way. Babs: Har! I think you may just be correct. Technodoll: Nothing is easy when dealing with them... er, or at least with MINE. Jay: It's a memorable time, alright. Even though I try to forget. EttaRose: Thank you and welcome! Oh no! Another conspiracy-theorist! Lady Banana: Is it not custom there? I would say 90% of the houses are lit up here. It's not really a custom that we have here in the Netherlands, thank goodness. When I lived in the States, my then husband decorated the house with lights each winter and made quite a spectacle of it. I didn't care for it that much. All blue lights in the hedge? Pretty horrible. Still, he was proud of himself. I was always rather embarrassed. That's great! I think we all know exactly that feeling! I'm sure it's a conspiracy from the Christmas light companies to drive us all crazy! BTW I love your blog you have a butterfly award at Mama and Hustler??? I am totally in agreement with the conspiracy. Seems that lights are manufactured in batches and then distributed. The batch molds are then destroyed and new batches are created that are 'different'. When you need to replace on strand....forget it.....you have to buy all new. I have run into this first hand, so I know it is true. This is why we don't put lights outside anymore. And half the people in our neighborhood just leave theirs up year round. 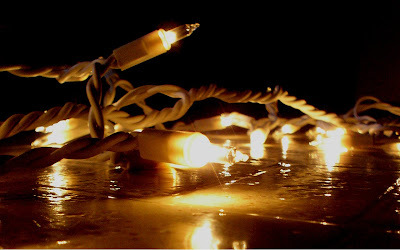 But you can get those plastic thingies where you wrap the lights around them and it keeps them tangle-free.